I bet he doesn’t accept credit cards. No, his bill’s so massive, it can only be paid upfront to the tuna thousands. What on earth is the pigeon doing in there, seriously? Did it lose a clog? www.youtube.com/watch?v=PO5ifLzLYiU it was dinner, that was what it was doing in there! rofl @ pelican taxi explanation! 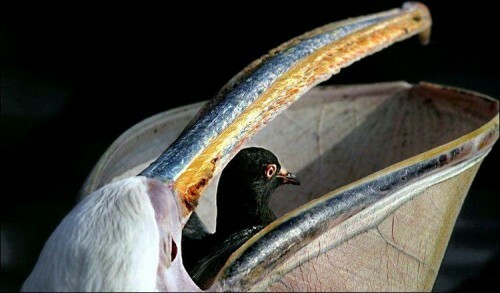 i don’t get it, does the top part of the beak expand? that looks like a completely nonfunctional or wrongly functional beak. thanks MCS, making me go do research on the internet. his lower beak reminds me of a saggy scrotum.